Photo is from the kit I purchased from Dating Divas. Have you ever been stuck in a rut on what to get your significant other or feel like you get them the same thing over and over again? I have been in this rut for years when it comes to getting my husband gifts. For Christmas I wanted to find a gift that is personable and unique. I also wanted to make the gift something that would be memorable and show him how much I love him. I found the idea of a year of date nights. With being parents of three young, active boys, and life being crazy this past year, I knew that it was important for my husband and I to try to find more time to spend with each other and set aside at least one day a month for a date. I made a binder which has twelve pre-planned and some pre-payed date nights for us to do. Some of the dates require the boys to stay overnight or need a sitter, and others can be done after the boys are in bed. I made the dates unique to us and involved exploring more of our city Columbus, Ohio. I found this great website called the Dating Divas and purchased this kit. 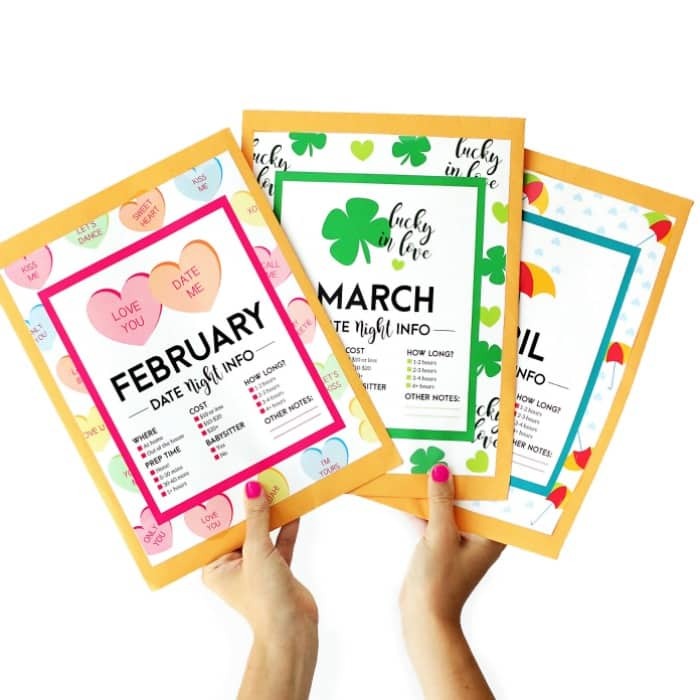 The kit provides a cover sheet for each month to check where the date will be, how much it will cost, how long the date will be, and you can write if you need a sitter or not. I took the pages and glued them to the front of folders. In each folder I provided the details of the date, any additional materials needed, and left a place to put pictures or momentous back in the folder after we did the date. I stapled the folders shut and put them in the binder. At the beginning of each month you open the date folder and plan when your date will be and gather any additional materials. My husband really loved this gift and is excited to see what we are doing each month. I am excited too because I know I can spend some time with him and experience new places. I also don’t remember the order I put the dates in, so each month is a surprise for me as well. We had our January date the other night and it was a slumber party date. The boys spent the night at the grandparents house. We then grabbed take-out for dinner and came home and caught up on shows, watched a movie, chatted, stayed up late, and slept in. We also worked on the Study Your Spouse worksheet and headed to a new coffee shop for breakfast before we picked up our boys. It was an enjoyable and low-key date that allowed us to reconnect. I am looking forward to our date nights each month for the rest of the year. It is something that is important as a couple and I want to make sure we set aside time for ourselves and our marriage as often as we can. For ideas on date nights as well and activities to include in planning, I headed to Pinterest. I also used Groupon to purchase an activity for a date and the Dating Divas website. I would love to hear what you plan or have done for a date night.